You might be under the assumption that after seventeen years, certain aspects of a band would have changed so fundamentally that the sound is no longer prevalent – or in some cases, even relevant – in this day and age. With the much anticipated release of emo darling American Football’s second self-titled LP, colloquially known as LP2, the question on anyone’s mind is: how could these low-fi leaders of the Midwest emo scene, now approaching middle-age, deliver the same je ne sais quois melancholia reflected in the average twentysomething? Overall, our fears have been assuaged. American Football’s lead singer Mike Kinsella has taken the care to keep the overall theme of the band crystallized in time, with messages successfully delivering the old emo nostalgia they so masterfully perfected at the turn of the millennium. Kinsella’s lyrics remain fatalistic in meaning and poetic in delivery, and are peppered with ruminations on the passage of time. The instrumental accompaniments are still as ambient and intricate as they were nearly two decades ago, albeit more produced and expanded with the help a full back-up band. American Football remains a fan of discordant time signatures, with guitar riffs and drum sets cleverly syncopated in rhythmic harmony to create a constant, moving ebb and flow underneath Kinsella’s vocals. Kinsella’s voice has aged like a good oak table, becoming more weathered and smooth as the years have passed. It remains a sturdy and present force amidst the swirling guitar, bass, and drums. However, his vocals stand at the forefront of tracks as compared to the last album, where he had a tendency to submerge himself in the instrumentals and resurface for clarity and emphasis. You won’t find any tracks along the lines of LP1’s “Honestly?” here; Kinsella has made the full transition into “frontman” after years performing as his solo act, Owen. The album begins quietly with “Where Are We Now?,” as if waking from a dream; chime-like electric guitar pickings precede Kinsella’s quiet “Where are we now?”. It is a subtle nod to the years that have passed since he last assumed the American Football mantle, and the song itself feels like shrugging on an old, well-loved jacket. American Football plays around with syncopation in “My Instincts Are The Enemy,” with choppy guitar and drum melodies acting as an introduction for Kinsella’s vocals, which alternate between his signature plaintive cry with soft falsetto. “I’ve Been Lost For So Long,” the first single released by the band, is a bleeding-heart track begging to be performed in front of an audience. It’s a new switch compared to the “old” American Football; most tracks on LP1 are contemplative and wandering, while this tightly produced track expertly fields a strong drum beat amongst layered guitar arpeggios. The syncopation returns for emphasis on the chorus. “Give Me The Gun” is an active track that also strays from the meandering ways of yore, focusing instead on projecting an atmosphere of constant fluid movement; guitars and drums are heavily layered. 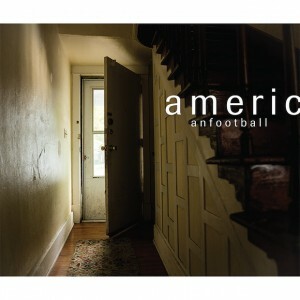 The album art from American Football’s LP1 features the plain exterior of a lit house at night, providing an accurate air of isolation and late-night contemplation. Compare the LP2 album art, which features not the outside but the inside of a nameless house, with the viewer’s vantage point set on an open door bathed in a morning glow. The subtle contrast provides a glaring thematic message: the outside façade may have not changed much, but the core entity now lends an entirely different view, and a hopeful one at that. While this may be the last we hear from American Football for the foreseeable future, the impact that these lost boys – now grown – have had on countless other lost listeners will continue to stand on solid foundations. This entry was posted in Reviews and tagged album review, American Football, emo, Indie, LP2 on October 26, 2016 by Juliana Van Amsterdam.